A reputation for quality building and joinery work in Harrogate and Yorkshire built on 35 years of service. We have a loyal and long serving workforce who have proved themselves not only to be capable but conscientious workers to have around your project. 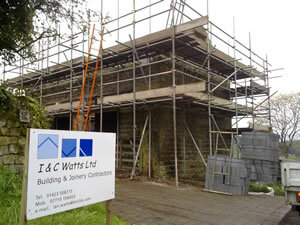 Founded in 1984, I & C Watts Ltd. is one of Harrogate's longest established Building & Joinery Contractors. The company works on a diverse range of projects, from renovating historical buildings, including the oldest in Nidderdale, through to an Eco house with all the latest green credentials. The company’s primary source of work consists of extending and renovating domestic properties in and around Harrogate, although the firm’s sign boards are frequently found on commercial works including schools, garages and charitable organisations. The family run business is headed by Ian and Robert Watts, underpinned by a dedicated team of joiners and builders, most of whom have been with the company for over 15 years themselves. I & C Watts prides itself on quality workmanship and reputation and are always pleased for the opportunity to quote for new business. I & C Watts is affiliated with the Federation of Master Builders (FMB), the National House Building Council (NHBC) and Constructionline. References are available on request, please contact us with your requirements.